This article is about the place in Donkey Kong Jungle Beat. For Japan-only arcade game, see Donkey Kong: Banana Kingdom. The Banana Kingdom is the first kingdom of Donkey Kong Jungle Beat and the D Barrel. The kingdom is located in a vast green jungle. The Banana Kingdom is accessible after the Opening Ceremony. The Banana Kingdom is the dominion of Dread Kong and Helper Monkeys. Donkey Kong travels through this kingdom to defeat Dread Kong. He eats through a giant banana at the end of both levels. Dawn Savanna is the first area of the Banana Kingdom. This level takes place on a grassland with many hills. Donkey Kong is aided by Combo Fairies and Helper Monkeys here. Donkey Kong also uses his vine swinging and climbing abilities to reach inaccessible areas. In this level, many new gameplay features are introduced to the player, such as Banandelions, which Donkey Kong can swing on to reach higher areas. Jungle Deeps is the second area of the Banana Kingdom. This level takes place in a large jungle, where Donkey Kong uses Banandelions to fling himself to high areas. He also harnesses the power of the forest mushrooms by clapping, causing the mushrooms to grow to an enormous size. Donkey Kong's first Jungle Buddy, Flurl, is introduced in this level as well. With the help of this new buddy, Donkey Kong glides his way to the exit. 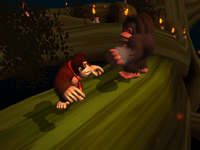 After clearing the first two areas, Donkey Kong must go up against Dread Kong, the game's first boss. The battle takes place on a large tree branch, with several Helper Monkeys, all holding torches in the background. His attacks are basic punches which can be dodged easily. After reducing his health to half of what it was, he only increases in strength while retaining the same attacks. Upon his reaching zero beats, he falls back onto the ground in defeat. This page was last edited on April 12, 2019, at 12:44.